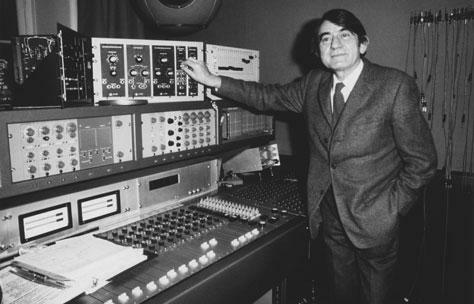 During the late 1960’s an intense intellectual animosity developed between the GRM and WDR studios ; The French GRM, lead by Pierre Schaeffer championed a Gallic free ‘Musique Concrete’ approach based on manipulated recordings of everyday sounds contrasting with the Teutonic German WDR’s ‘Electronische Musik’ approach of strict mathematical formalism and tonality (probably a simplistic analysis; read Howard Slater’s much ore insightful essay on the schism). 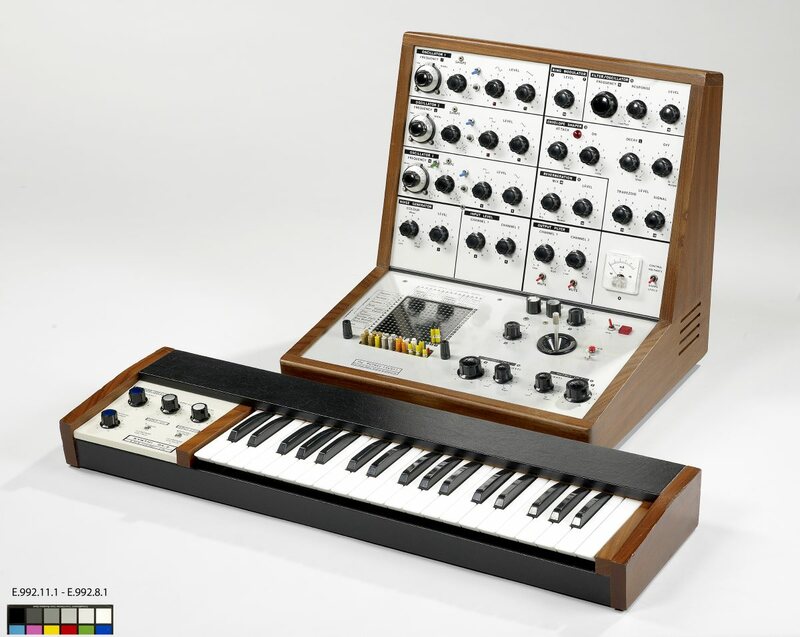 This divergence in theory meant that the studios developed in diverging ways; the Parisian GRM based on manipulation of tape recording and ‘real sound’ and the WDR studio on purely electronically synthesised sound. 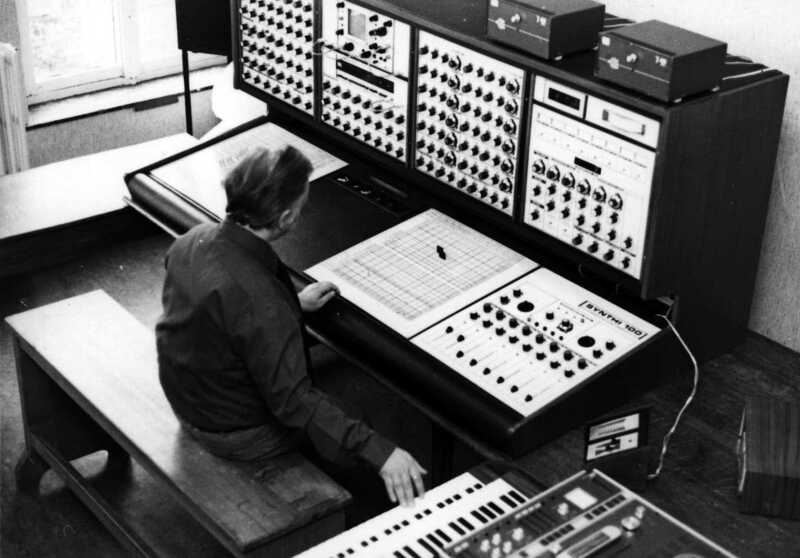 Pierre Schaeffer by the console of Studio 54 adjusting Moog, the Coupigny Synthesiser is built into the panel directly below. 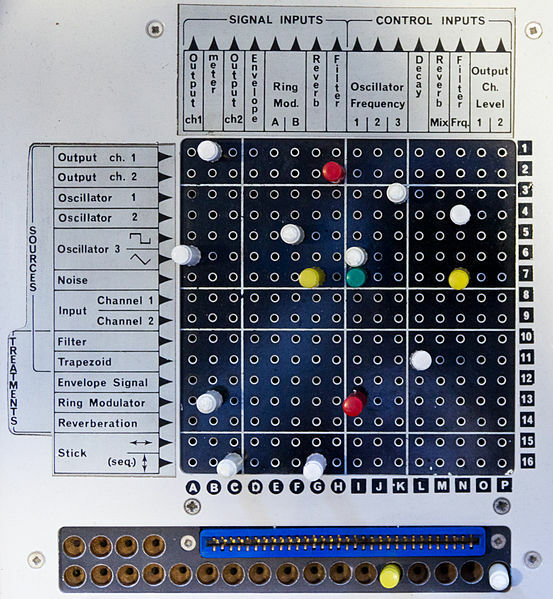 The Coupigny Synthesiser was a modular system allowing patching of it’s five oscillators using a pin matrix system (probably the first instrument to use this patching technique, seen later in the EMS designs) to various filters, LFOs (three of them) and a ring modulator. 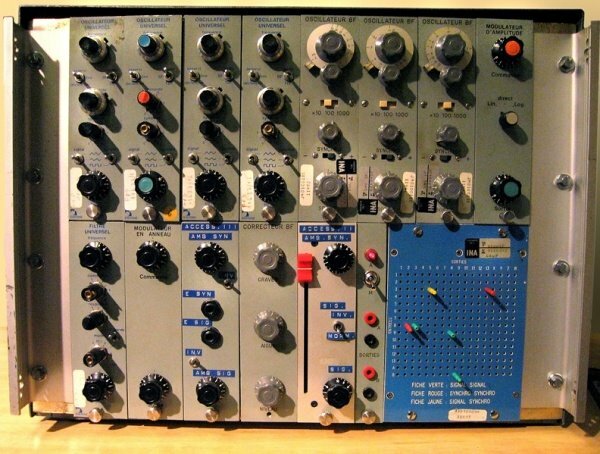 Later versions were expanded using a collection of VCA controlled Moog oscillators and filter modules. 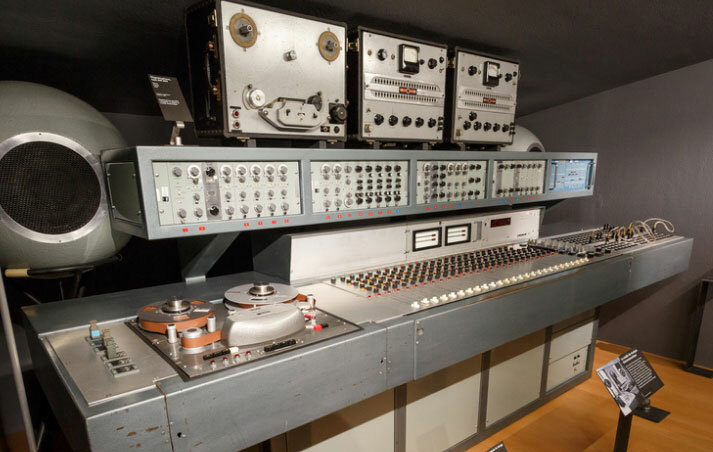 The instrument was completely integrated into the studio system allowing it to control remote tape recorders and interface with external equipment. 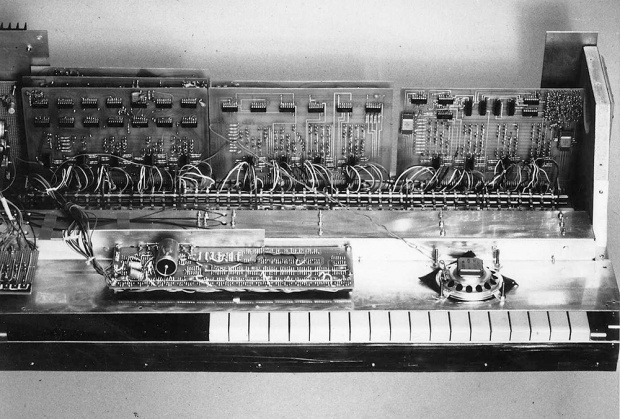 Unlike many other electronic instruments and perhaps due to Schaeffer’s concerns over ‘parametrical control’, the Coupigny Synthesiser had no keyboard – instead it was controlled by a complex envelope generator to modulate the sound. 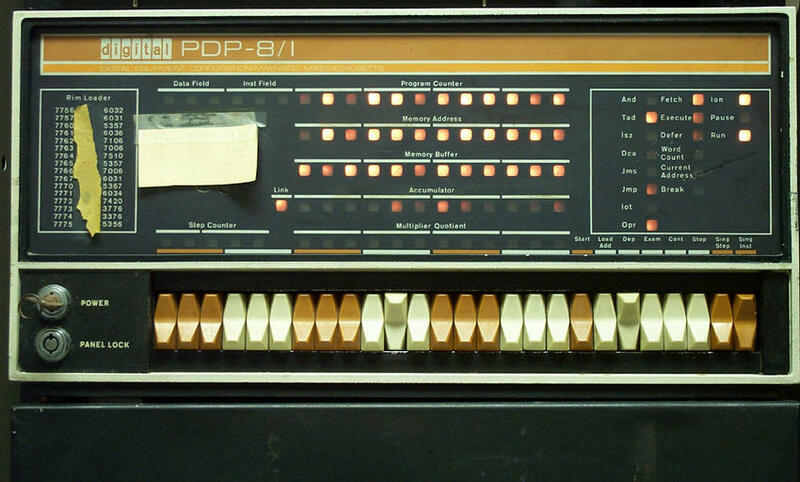 This made the synthesiser less effective at creating precisely defined notes and sequences but better suited to generating continuous tones to be later edited manually on tape. 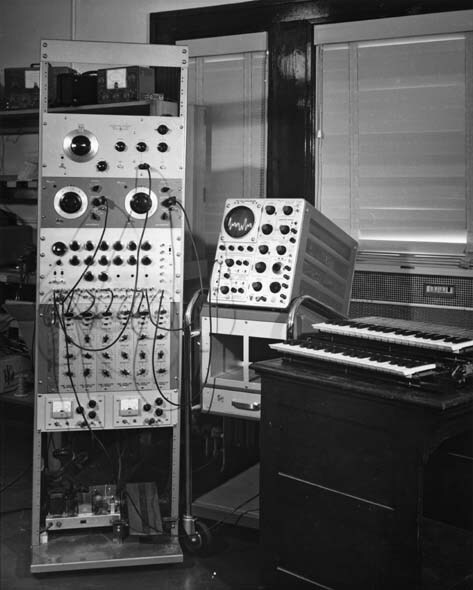 The Coupigny Synthesiser continues to be used at the GRM studio to this day. 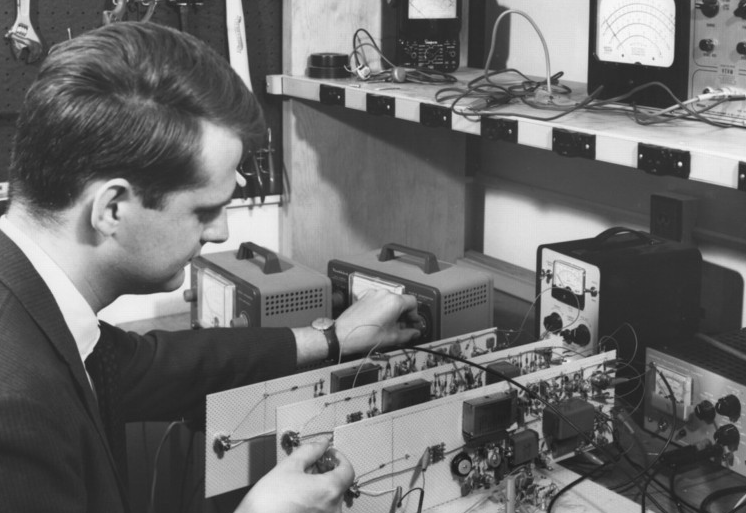 James Beauchamp invented the Harmonic Tone Generator in 1964, one of the first additive electronic voltage-controlled synthesisers, under the direction of Lejaren Hiller at the Experimental Music Studio at the University of Illinois at Urbana-Champaign. 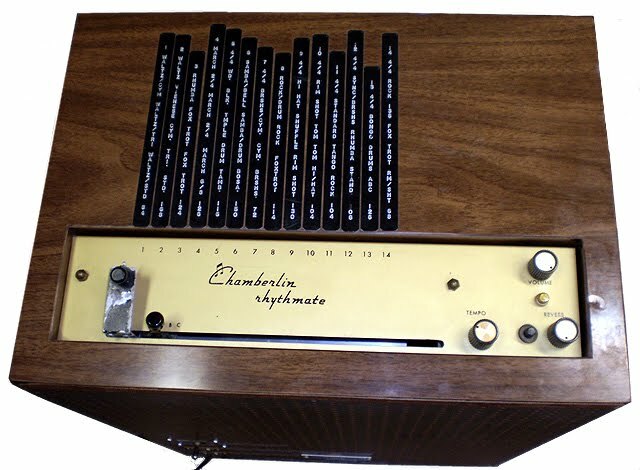 “The instrument synthesised six exact harmonics with variable fundamental frequency from 0 to 2000 Hz. The amplitudes of the six harmonics, the fundamental frequency, and the phase of the second harmonic were programmed by voltage control. The fundamental frequency (pitch) was controlled by an external keyboard or generators to provide vibrato and other effects. Control of amplitude was provided by special envelope generators or external generators or even by microphone or prerecorded sounds. The harmonics were derived by generating pairs of ultrasonic frequencies which were nonlinearly mixed to produce audio difference frequencies. That is to say, one set of frequencies, 50 KHz, 100 KHz, …, 300 KHz, was fixed. Another set, 50-52 KHz, 100-104 KHz, …, 300-312 KHz, was variable. When 50 and 50-52 KHz, etc., was mixed, the sine tones 0-2 KHz, … was derived. Harmonics were generated by full-wave rectification (even harmonics) and square wave chopping (odd harmonics), followed by band pass filtering to separate the harmonics. The envelope generators consisted of variable delays and attack/decay circuits. In response to a trigger signal from the keyboard, after a programmed delay, the envelope generator would either rise and then go into an immediate decay while the key is depressed or it would rise and decay after the key is depressed. Having the upper harmonics delayed with respect to the lower ones gave an interesting effect. Hiller, Lejaren, and James Beauchamps, .Research in Music with Electronics., Science, New Series, Vol. 150, No. 3693 (Oct. 8, 1965): 161-169. IPEM electronic music studio founded in 1963 as a joint venture between the Belgian Radio and Television broadcasting company and the University of Ghent with the objective of operating as both a creative studio, and a research institution – IPEM continues to this day to research into audio and psychoacoustics. 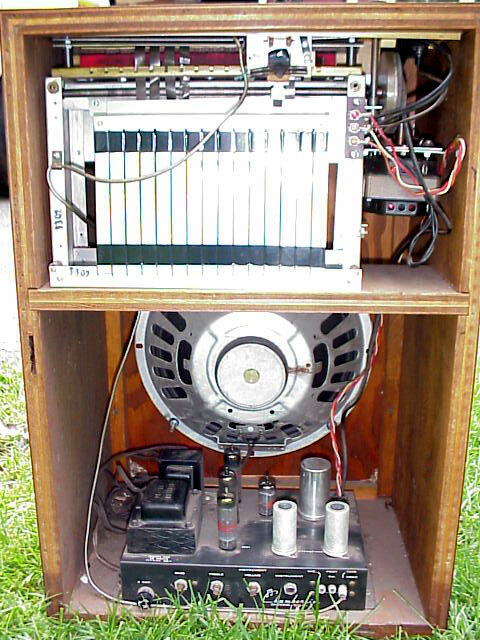 One of the first instruments developed was a sine wave generator by Hubert Vuylsteke. His assistant, an engineer called Walter Landrieu, invented a vacuum tube based instrument called the ‘Melowriter’ in 1976 that allowed the musician to create sounds through an 8bit code typewriter style interface. 470 compositions were realised at IPEM between 1963–1987. It is still operational, housed in the University building in the same place it was founded. 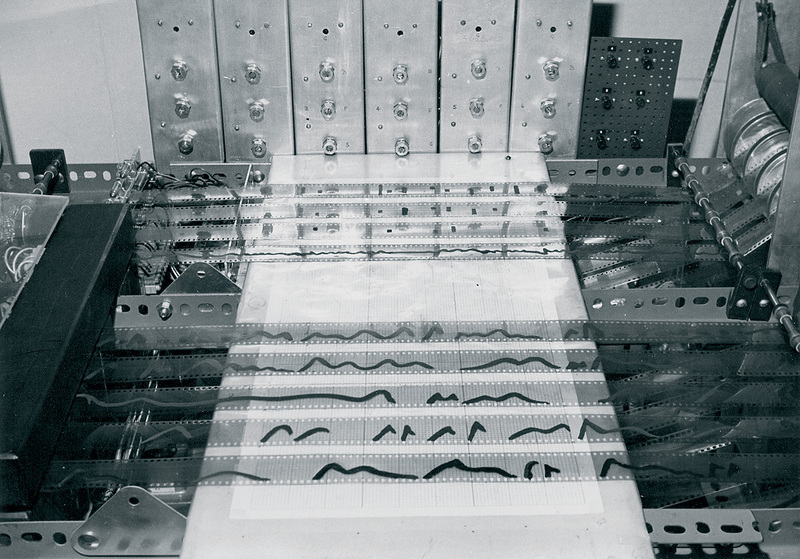 IPEM: Institute For Psychoacoustics And Electronic Music: 50 years of Electronic And Electroacoustic Music At The Ghent University is published by Metaphon, and comes with 2CDs of music made at the studio between 1963 and 1999. More details on the book here. 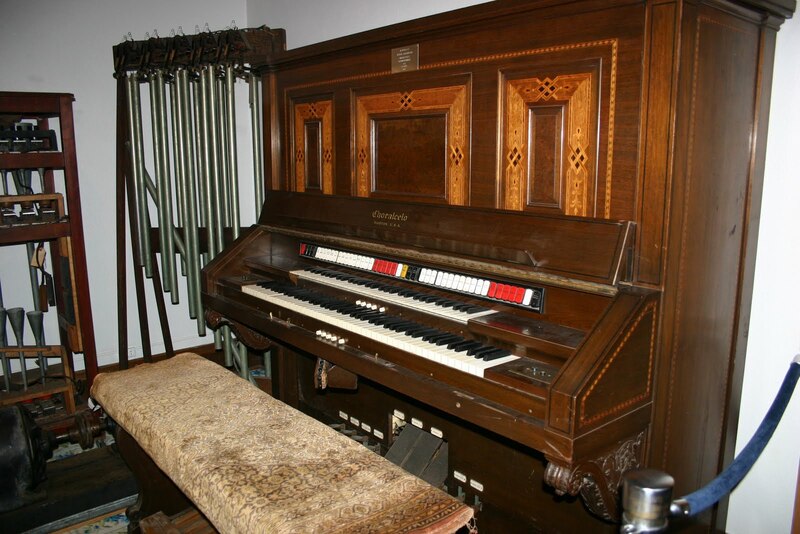 The Choralcelo (“heavenly Voices”) was a hybrid electronic and electro-acoustic instrument conceived as a commercial high-end domestic organ, sold to wealthy owners of large country houses in the USA. 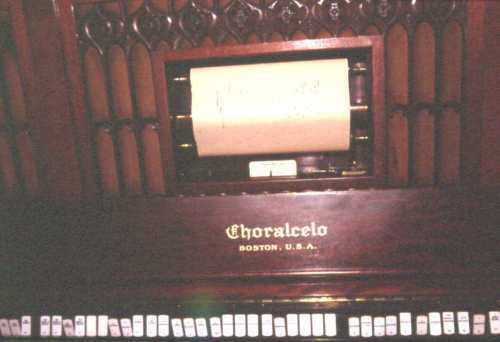 The Choralcelo was designed and developed by Melvin Severy with the assistance of his brother in law George B. Sinclair and manufactured by the ‘Choralcelo Manufacturing Co’ in Boston, Massachusetts. 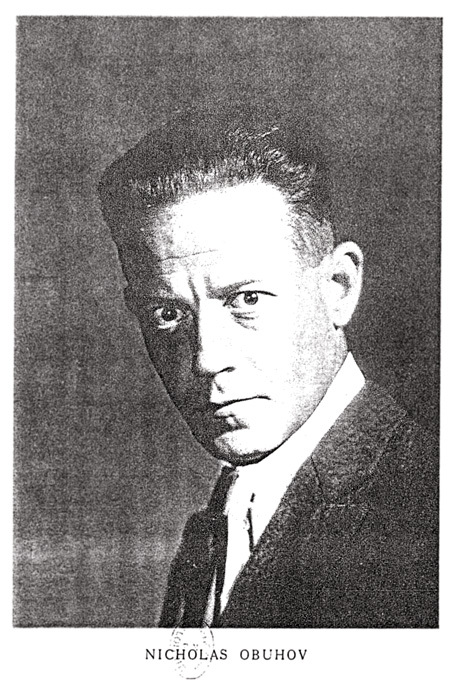 Later models were extensively redesigned and improved by Quincy Sewall Cabot, inventor of the ‘Synthetic Tone’. 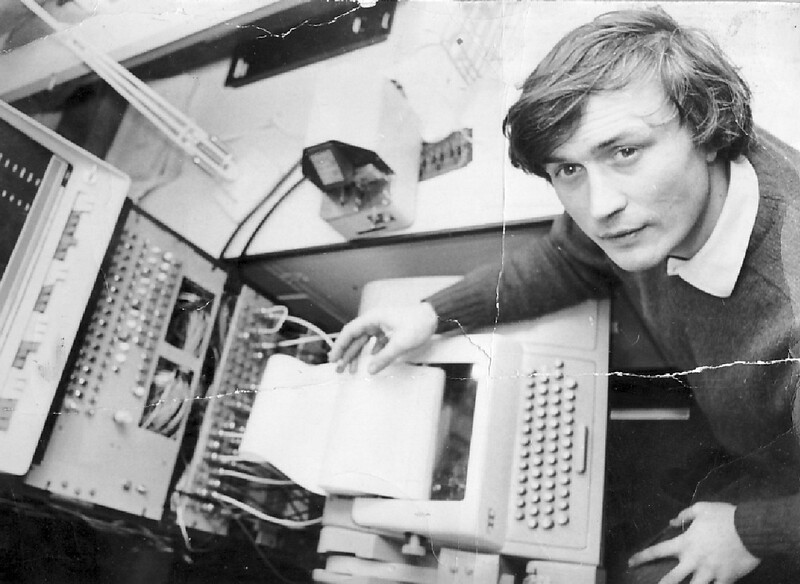 Severy was a versatile inventor, engineer musician, composer and author. Before the Choralcelo, Severy’s inventions already included patents for printing presses, solar heating systems, a camera, fluid drives, and many others.The Choralcelo was developed by Severy from 1888 until 1909. 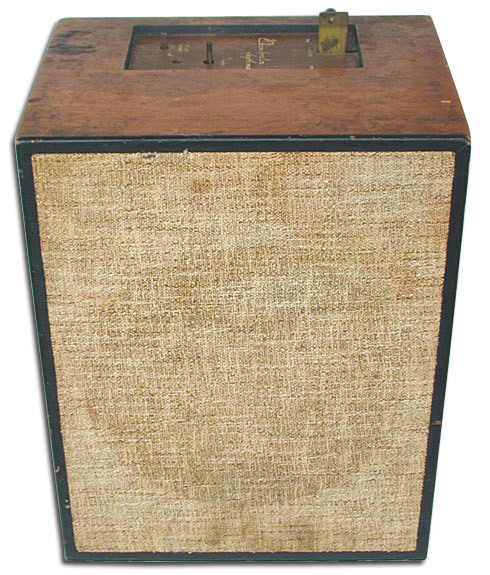 Te instrument was first presented to the public on the 27th April 1909 at the Boston Symphony Hall,in Boston, Mass. At it’s unveiling the Choralcelo was accompanied by A soprano voice and about forty members of the Boston Symphony Orchestra and was said to have been ‘enthusiastically received’ by some of ‘Boston’s best known families’. As for the Choralcelo itself, it proved an interesting and unique instrument. Fronting the audience from the platform was a mahogany box to disguise an upright piano somewhat exaggerated, and with two rows of keys. 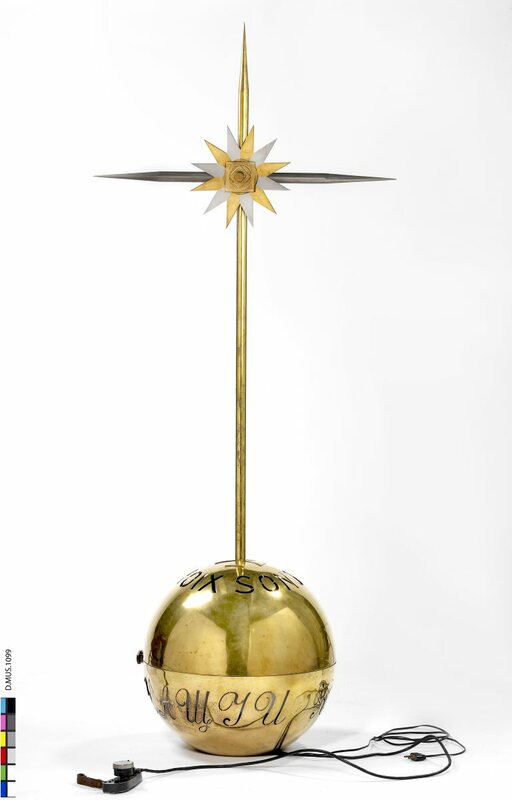 The Instrument, it was announced, resulted from twenty one years of persistent labour on the part of it’s inventor Melville (sic) L. Severy and George D. Sinclair both of Boston. 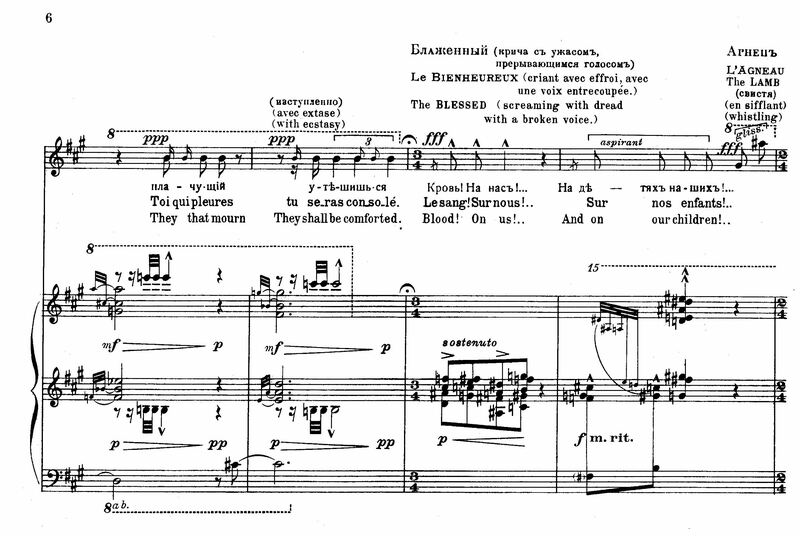 The Choralcelo obtains sound of the violincello, the trumpet and the French horn , the oboe and the bassoon, the harp and the pipe organ from a single compass from the wire strings used in the pianoforte, which are vibrated by means of small electro-magnets stationed at scientifically determined points along their length. 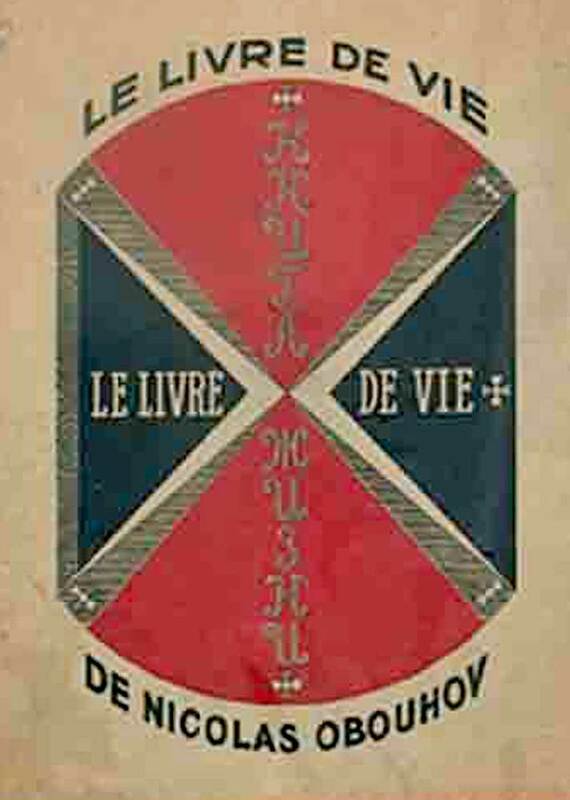 programme of the first Choralcelo concert, Boston, 1909. The Musical Age.New York, May 1st 1909. 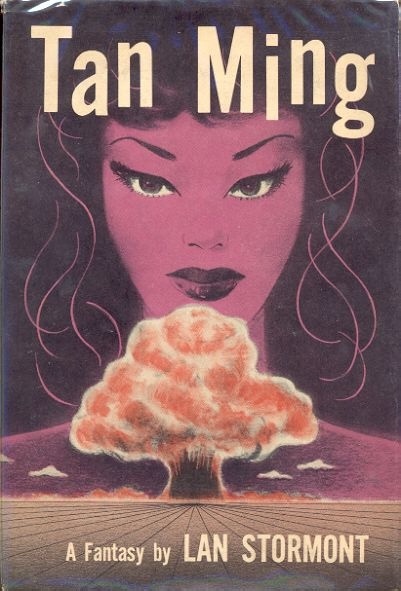 The company was taken over in 1918 by Farrington. C. Donahue & A. Hoffman (in some reports claimed as its inventor). At least six of the instruments were sold and continued to be used up unit the 1950’s. 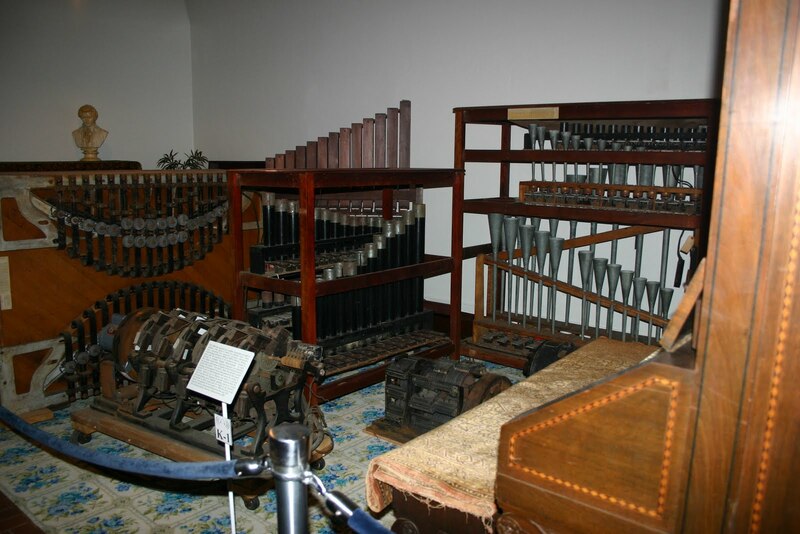 Two working examples of the instruments are known to have survived in the USA one at Ruthmere Mansion in Elkhart, Indiana.The Choralcelo was a direct contemporary of the Telharmonium, though not as big, was still a huge instrument using a similar electromagnetic tone wheel sound generation to the Telharmonium used in the ‘organ’ section of the instrument as well as a set of electromagnetically operated piano strings. 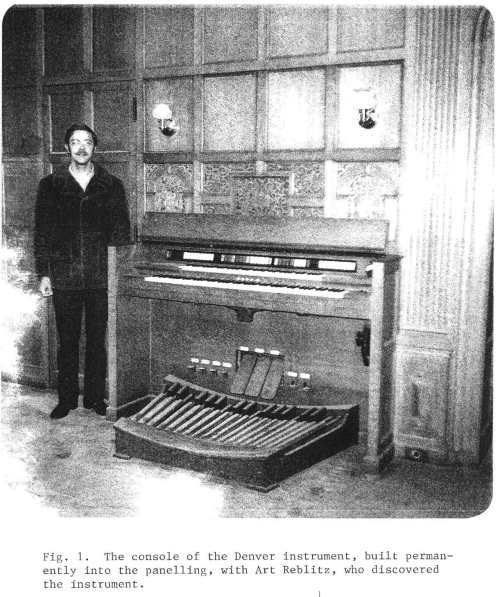 The visible part of the Choralcelo consisted of two keyboards, the upper (piano) keyboard having 64 keys and the lower 88 (piano and ‘organ’), controlling the invisible part of the instrument, usually in the basement of the house, consisting of 88 tone wheels and a set of piano strings and bells that were vibrated by electromagnets and a set of hammers. 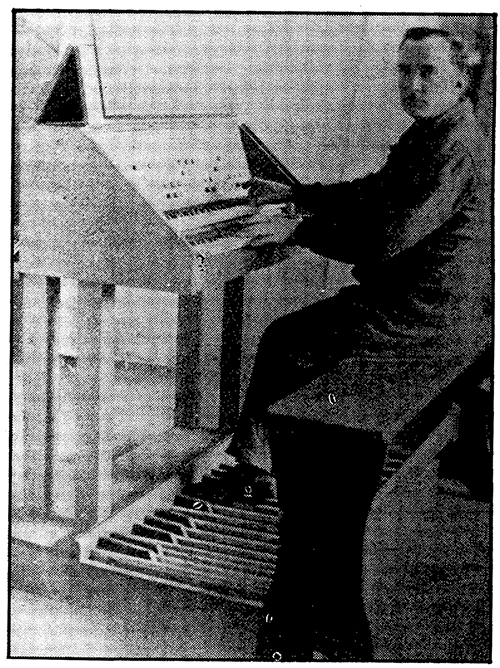 The keyboards also had a set of organ style stops to control the timbre and fundamentals of the tone that could then be passed through cardboard, hardwood, softwood, glass, steel or “bass-buggy” spring resonators to give the sound a particular tone.The Choralcelo also incorporated a pianola style paper roll mechanism for playing ‘pre-recorded’ music and a 32 note pedal board system. The entire machine could occupy two basements of a house, the keyboards and ‘loudspeakers’ being the only visible part of the instrument. “The story of the Choralcelo is largely the story of two men… Melvin L. Severy, born in 1863 in Melrose, Mass; died in California in 1951; and Wilber E. Farrington, born 1869, died 1945. Severy was a brilliantly gifted, multi-faceted inventor who secured patents on a printing press, solar heating, a camera, fluid drive, and many others, besides the Choralcelo. He was a scholar, artist, musical composer, and author. His grandson recalls that he was interested in secret passages in the pyramids, to name one of his many interests. 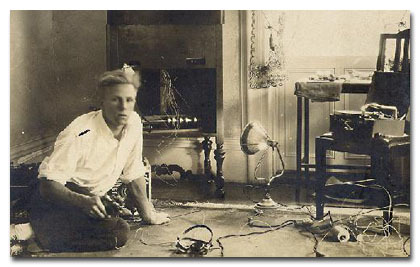 Severy was assisted in his experimentation by his brother-in-law, George B. Sinclair. They had married Flint sisters. 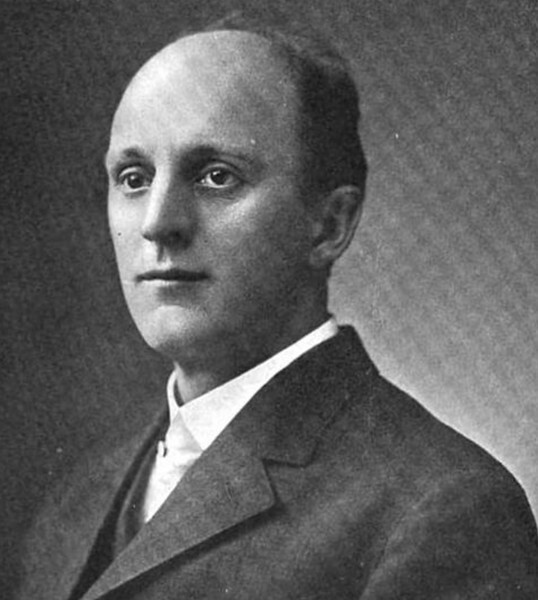 Wilber Farrington was an idealistic, philosophic visionary who devoted the majority of his life to his love of the unique tone of the novel instrument and his determination to see it successfully developed and manufactured. 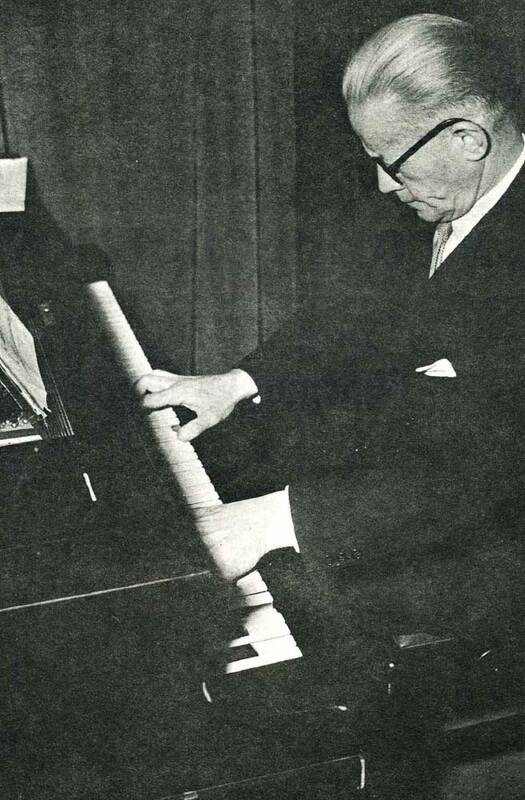 He was a charismatic and effective fund raiser and invested his own fortune in the work.There had been many efforts at strengthening or lengthening the tone of piano strings electrically. 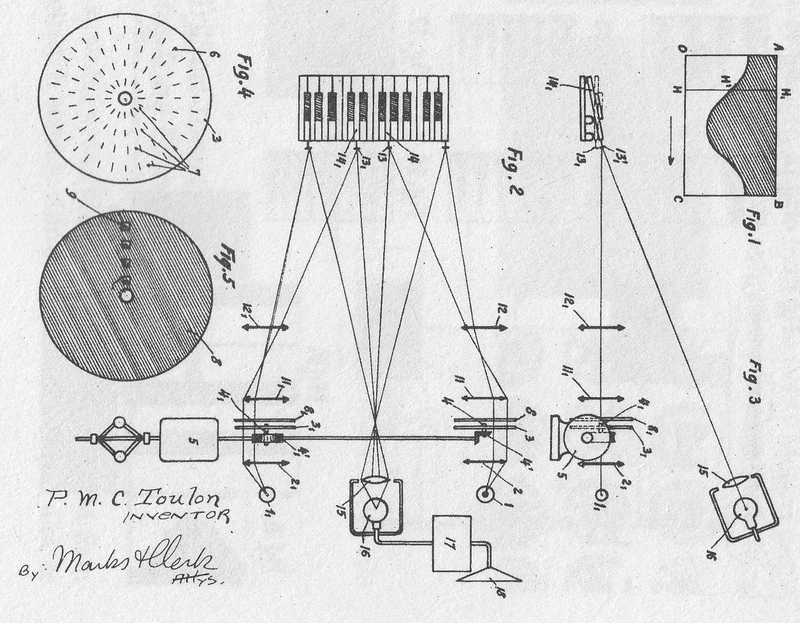 As early as 1876, Elisha Gray had patented a single note oscillator; and in 1890 Eli C. Ohmart filed a patent on prolonging the tone of piano strings electromagnetically… the patent was assigned to Melvin Severy. The principle being worked on was simple… magnets were placed behind the strings of the piano, and accurately timed pulses of DC current were fed to the magnets coinciding with the natural periodicity of the strings.. for example, if note A vibrated at 440 vibrations per second, then 440 pulses of current per second would be fed to the magnets for that note, and sustained organ-like tone would be produced without the use of the hammers. The mechanism which accomplished this was the interruptor, powered by a small electric motor, which had nine brass cylinders 3 1/2″ long spinning at predetermined speeds. Each cylinder had eight make and break tracks 1/4 inch wide, alternate spaces being set in an enamel, a non-conductor. Sterling silver brushes rode on these tracks. The lowest notes required about 20 pulses per second, and the highest, about two thousand. The overwhelmingly difficult part was the governing of this device… the very slightest deviation and the frequency of the pulses would not coincide with the natural periodicity of the strings, and the tone will die. Patent after patent was filed for variations on governing mechanisms, some of them so elaborate that they were complicated mechanisms in themselves. The basic concept of tone production, though simple, proved nearly impossible in execution… matching, on one side, an already tuned vibrating body, with perfectly matching pulses of magnetism, ranging anywhere from 20 vibrations per second to 2,000. 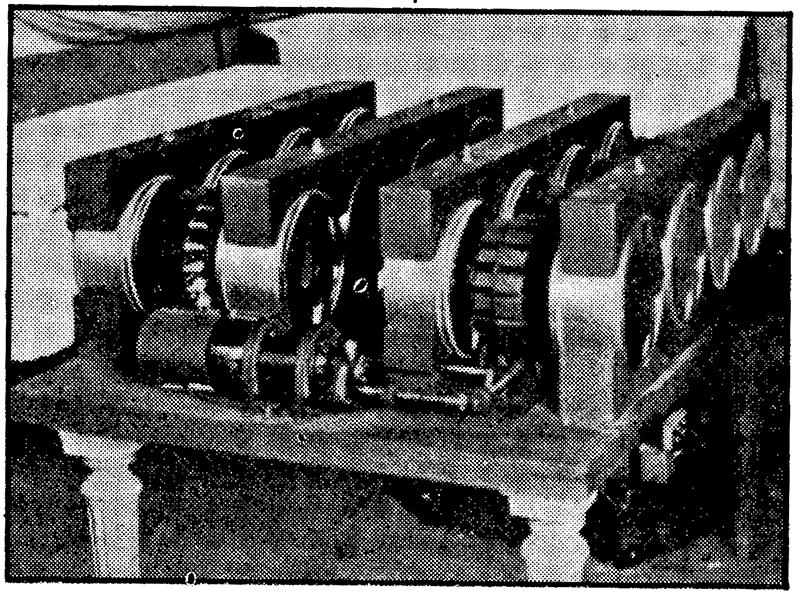 The governing device controlling the speed of the make and break cylinders would not only have to provide such absolute perfection whenever called for, but would also have to be able to compensate for the vagaries of the electric current generated in that day, which powered the motor the drove the governor… to do this, it would have to be able to keep the cylinders rotating without the slightest deviation even if the motor driving the assembly slowed down or speeded up. If the speed of the cylinders changed while the instrument was being played, the tone would die out. An elegantly simple, brilliant magnetic combination governor and clutch evolved, which performed perfectly without physical contact, so there could be no overheating, and there were no clutch pads or other friction assemblies to wear out. Even today it is a marvel of brilliant application of principles of physics , and a marvel at least to those who are aware of what they are seeing to watch the spinning copper band drive the heavy flywheel merely by cutting through the invisible magnetic force. It is so disarmingly simple one could have no inkling of the years of labor which preceded it. Appreciating what it represents, I still have a feeling of awe. I doubt there has ever been anything like it, before or since. It was through the many mechanisms Severy laboured over and patented in his determination to solve the problem that fluid drive evolved. The first concert was given in 1905, and was by invitation. The Choralcelo of that first phase of development was an impressive upright piano with one keyboard, usually with a roll player; the case of the finest grain mahogany with beautifully hand-carved openwork scroll panels. The tone could be varied by means of a slider near the left hand. It was the first tone produced without physical contact of some kind, and the tones produced invoked orchestral instruments minus the sound of the bow on the string or the breath of the flutist. Development continued and a two manual instrument marked the second level, or phase, of the evolution of the Choralcelo. It still had the piano keyboard and piano strings which were excited by magnets. The piano strings were tuned by means of screws to attain greater stability. There was an organ keyboard above the first one, and a row of stops to control the range of tone units. These took the form of sets of tuned bars, or plates, which could be of steel, or wood, or aluminium, or sometimes glass. There were usually 41 to a set, and typically they varied in length from 5 3/4″ to 10 1/2″, and usually were about 5/16″ thick. Materials other than steel had small iron armatures affixed so that there would be response to the magnets. Installed directly over these bars were resonating chambers, usually cylindrical fiber tubes, open at each end, which reinforced the tone, just as one sees in marimbas and vibraharps, The tone production was entirely acoustic; there was nothing electronic about the Choralcelo… no amplifiers, no loud speakers, no tubes… nothing of the sort. These sets of bars were remote from the main console and could be placed anywhere. 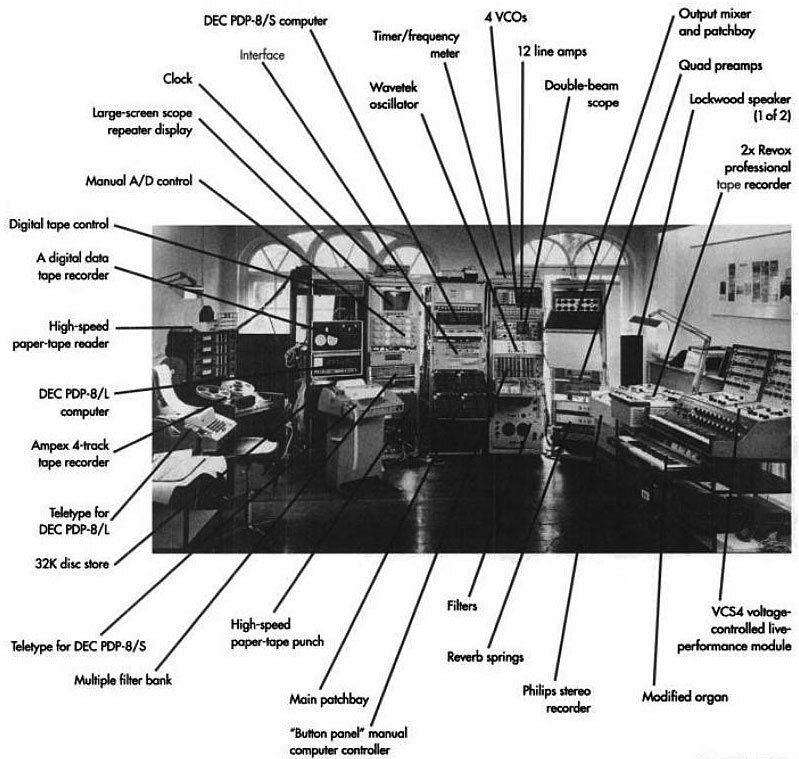 The switching and control devices were remote from the main console and could be contained in two cabinets, each about 5 1/2′ high, and installed in the basement, along with the interrupter mechanism and motor-generator which delivered 30 volts of DC. The bar units could also be installed in the basement if desired, in which case grillwork was installed in the floor above them to transmit the sound; or they could be installed in the music room where the console was and concealed behind panelling or whatever was desired. The units were all connected by cables, usually armored with interwoven wire strands to protect them from damage. If all the machinery and also the bar units were to be placed in the basement, the space required would be approximately that of a modest bedroom. The final phase of the development of the Choralcelo was the rewiring of the controls so that upper partials could be at the command of the Choralcelist and thus the potential of the instrument was greatly expanded because infinite variations and combinations were now available. 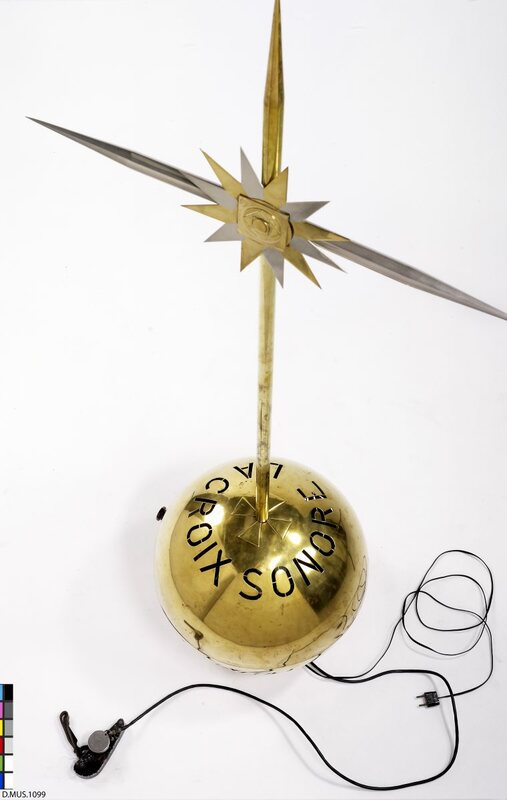 The attempt to produce a completely new, unique instrument of this complexity in such a short period of time… the original factory closed in 1917 because of the war… was a monumental undertaking, and the multiplicity of the directions one might take was daunting. After all, the piano metamorphosed over several centuries, and other instruments have done the same. Experiments were conducted with reeds. A magnificent, large double bass unit having steel ribbons instead of individual strings was developed… there was a remote full-sized string unit which could be remotely placed… A variation of the interrupter mechanism was developed using brass discs instead of the earlier cylinders. There were twelve discs, each with six tracks, rotating at speeds determined by the gearing. All of these inventions, some of which were superseded by later ones, required designing, engineering, machining.. the investment was astronomical. In today’s money it amounted to many hundreds of millions of dollars. The instruments themselves were expensive, by today’s standards costing about a half million. There were about one hundred built, many of them being installed in the music rooms of the wealthy. There were some that were in theatres to accompany silent films… Filene’s in Boston had two, one in the restaurant. Lord and Taylor in New York, and Marshall Field in Chicago, among others, featured Choralcelos, as did several hotels. There were even two on yachts. In India, far away, as the popular song goes, the natives are content to regale themselves musically with plaintiff notes given forth by a goat skin stretched over the end of a hollowed log, upon which the musician beats a tune with the flat of his hand. The music of the caveman was the wind is sighing through the trees, accompanied by the rustle of the leaves. Even they wanted to express themselves in a harmonious manner, hence the drum, the horn and other crude instruments of musical expression. Then we may possibly expect some marked advances in our musical culture and education since the advent of the “Choralcelo,” despite the prophecies of those who take a pessimistic view of life in general. The piano becomes a tongue-tied infant beside the latest masterpiece of the musician’s art. At times its notes thunder forth and seem to shake the very earth itself, and then again they may be subdued to an elusive softness like unto the faint notes of a distant church choir. But what is it? How is it accomplished? What is the result of many years of untiring labor on the part of several of the cleverest men of the world? What is it upon which a fortune that would ransom a king has been spent? The Choralcelo! The Choralcelo, the most wonderful musical instrument ever thought out by the human mind, is like nothing else the world of music has ever known. This masterpiece reproduces any piece of music in any form of instrument, from a string to a flute; not only does it reproduce them, but the notes emitted by it are sustained, pure and sweet, which is entirely different from the ones produced by the instruments that are in present use. Practically all the musical instruments, previous to the invention of the Choralcelo, carry into the tone which they produce certain impurities which arise from the manner in which they are caused to vibrate. The violin interrupts the free vibration of the string by the grating rub of the bow. The piano adds the noise that results from the blow of the hammer on the string – while the organ mingles the breathiness of its air current with the pure vibrations of the column of air in the pipe. In like manner all instruments employing extraneous contacts to start the vibration destroy the purity of the note produced. And as they seek to amplify the tone they have produced they increase the intrusion and false sounds. The soft pedal of the piano, the swell-box of the organ, the mute of the violin, are just so many outrages on the purity of the tone. The Choralcelo, by the very means which it employs in producing the tones, is freed from all obstructions. Vibration without contact, involving perfect freedom of vibration, and thus the Choralcelo gives all the natural overtones and harmonics; rich – full – pure and perfect, thus opening to the musician wonderful possibilities of expression and emotional power of which he possibly never dreamed. The manner in which this result is accomplished is one of wonder. It is the subtle pull of the electro-magnet which now achieves pure tone production. These electro-magnets are caused to act directly upon the strings of the instrument. The most delicate graduation of tone power can be produced by the mere variation of the strength of an electric current, and not by smothering devices which the present form of instrument employs. The tone, therefore, retains all its original purity through all vibrations and intensity, something that has been impossible heretofore. We will next inspect the mechanism employed to perform these wonders. It may be stated that the vibrating elements are caused to oscillate by means of a pulsating electric current sent through an electro-magnet acting on the vibrating membrane. The machine which beaks up continually the electric current into a series of waves is really the “heart” of the Choralcelo. The operating device consists essentially of a series of metal discs having a certain number of insulating segments inserted into their peripheries. These discs are arranged to revolve at a fixed speed. Silver-tipped brushes are so placed that they will bear upon the revolving discs. It will thus be seen that in order to produce the fundamental periodicity of any given “string”, it is only necessary to rotate a disc containing a certain number of segments at the correct speed. A large number of combinations are possible through the manipulation of a few keys, which correspond to the stops of an organ, and such a keyboard is clearly shown at Fig. 1. This resembles a piano, and it really is one, with additional keys and pedals. The pedals are used to vary the strength of the current sent through the electro-magnets. A tremolo effect is given by means of a slow speed interrupter giving a pulsating current at a few revolutions per second. The instrument which produces this effect is depicted on the right of Fig. 2, while the one towards the left reproduces tones representing a flute. The regulation piano tone is produced with the usual percussion hammers, which may be thrown into or out of action by the pressure of a key. The staccato notes of the piano may be struck upon strings already vibrating with the pulsating current. Thus sustained notes of a higher pitch are produced upon the string. 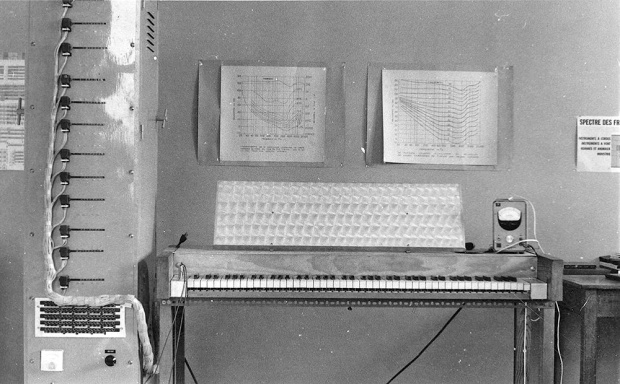 A piano which employs both the electro-magnets and hammers is clearly shown on the left of Fig. 3. Note the large number of wires which are employed for connecting the various for connecting the various magnet coils. It is an engineering feat in itself to even make and wire the various circuits. Marvelously sweet tones are produced by vibrating pieces of brass, wood and aluminum. In fact, any resonant body susceptible to vibration may be made to emit tones. In order to cause these bodies to vibrate, it is necessary to place within them a small piece of iron, so that the electro-magnets may attract them. Instruments that are operated by this method are depicted in Fig. 3. The one toward the right is an instrument that imitates a flute. The electro-magnets are placed underneath the tubes, which are made out of wood and act as resonating chambers. The magnets are caused to act on iron discs mounted at the lower end of the tube. Another style of flute instrument is illustrated in Fig. 4. This employs a different variety of tubes, ranging from a very high tone to a very low one. The smaller pipes give the latter tone, while the larger ones the former. The instrument shown in the center of Fig. 3 illustrates a brass chime. The tones are produced by hammers, each of the tubes being supplied by one. These are operated by electro-magnets, as perceived in the upper bracket of the stand. These are also connected to the same keyboard. The very deep tones of an organ are produced by vibrating diaphragms placed beneath metal horns. A pair of electro-magnets are held a minute distance away from the diaphragm and serve to vibrate the latter when the pulsating current is applied. The volume of the tones is powerful and is very pleasant although it is very low. By increasing the power in the electro-magnets, the strength of the tones is so much increased that it is almost impossible to imagine the effect. “Echo” combinations may also be installed without limit wherever their effect may be most beautiful at any distance from the master instrument. Thus the greatest cathedral may be filled with a glory of sound. The tower may be used to flood the surrounding country with the same divine melody. It may also be carried to the quiet cloister and to the private room. An instrument played in one place may repeat its music elsewhere. The Choralcelo was developed and its wonderful basic principle discovered by Melvin L. Severy of Arlington, Mass., and George B. Sinclair. These savants have been working for twelve years to bring this musical instrument up to the perfection which it has reached today. One cannot predict its possibilities or limits as it is really still in its early stages of development. ‘Oramics’ Daphne Oram. UK, 1959. 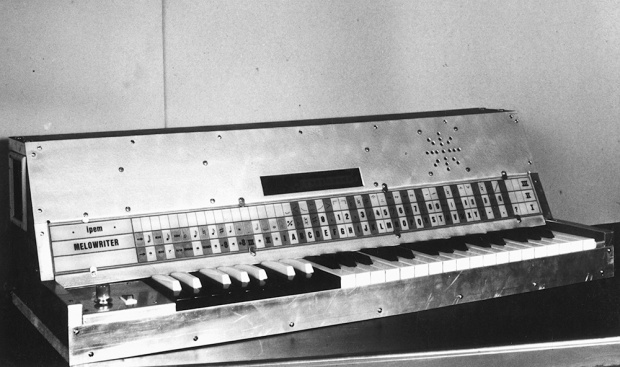 The technique of Oramics was developed by the composer and electronic engineer Daphne Oram in the UK during the early 1960s. 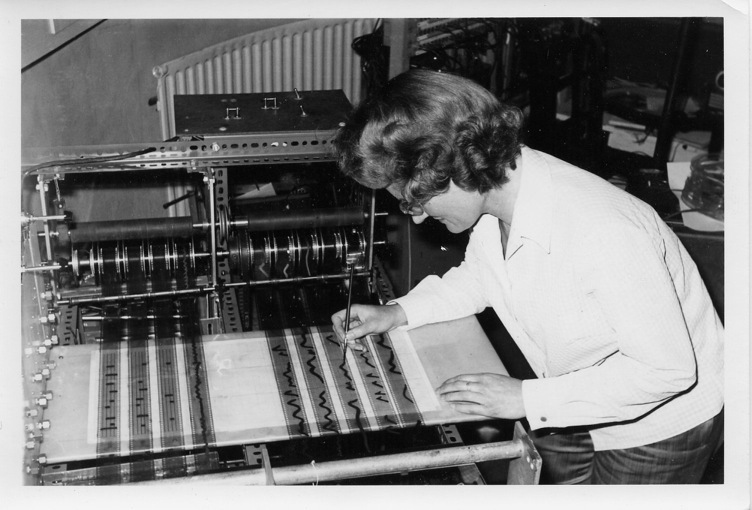 It consisted of drawing onto a set of ten sprocketed synchronised strips of 35mm film which covered a series of photo-electric cells that in turn generated an electrical charge to control the frequency, timbre, amplitude and duration of a sound. 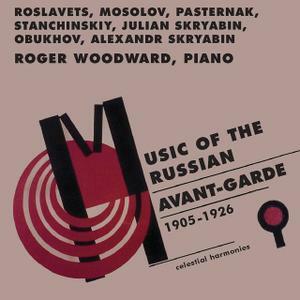 This technique was similar to the work of Yevgeny Sholpo’s “Variophone” some years earlier in Leningrad and in some ways to the punch-roll system of the RCA Synthesiser. 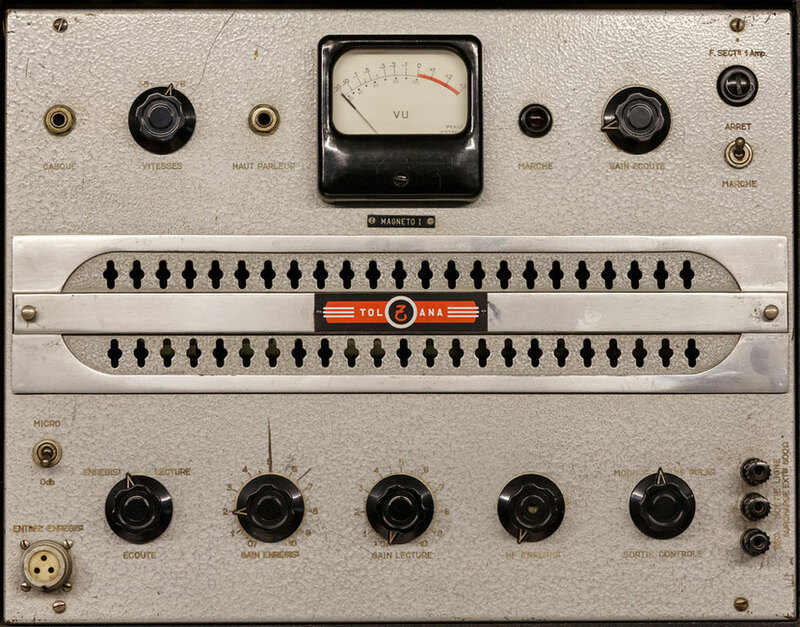 The output from the instrument was only monophonic relying on multi-track tape recording to build up polyphonic textures. 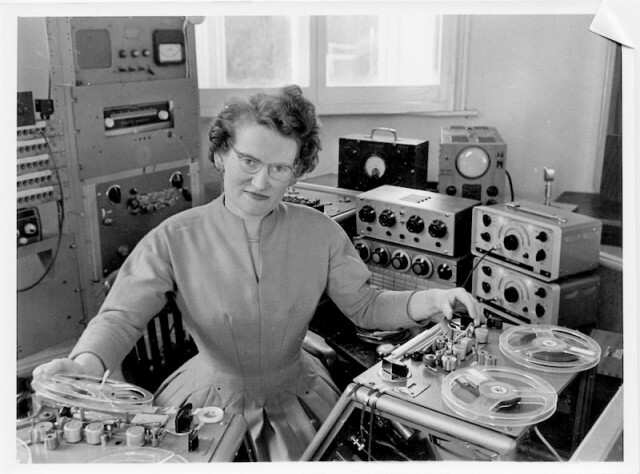 Oram worked at the BBC from 1942 to 1959 where she established the Radiophonic Workshop with Desmond Briscoe. She resigned from the BBC in 1959 to set up her own studio the ‘Oramics Studios for Electronic Composition’ in a converted oast-house in Wrotham, Kent. With the help of the engineer Graham Wrench, she built “with an extremely tight budget and a lot of inverted, lateral thinking” the photo-electrical equipment she christened ‘Oramics’ which she used to compose and record commercial music for not only radio and television but also theatre and short commercial films. 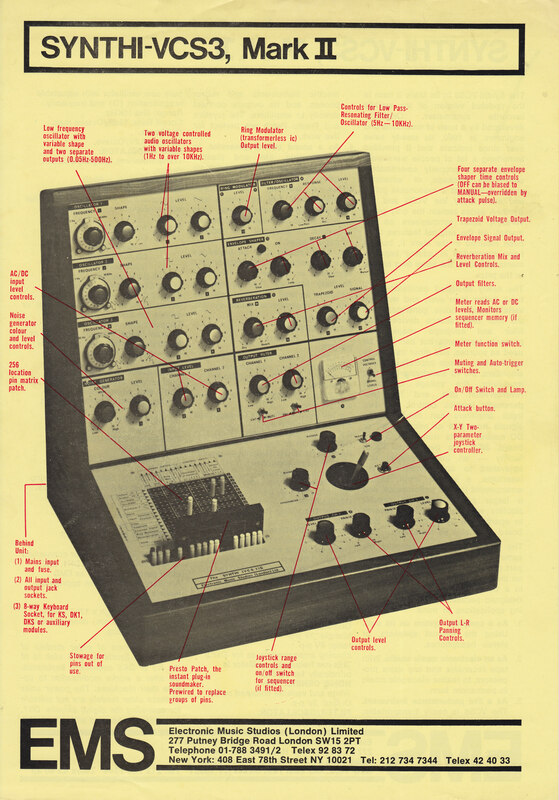 The attraction of this technique was a direct relation of a graphic image to the audio signal and even though the system was monophonic, the flexibility of control over the nuances of sound production was unmatched in all but the most sophisticated analogue voltage controlled synthesisers. Daphne Oram continued to use the process throughout the sixties producing work for film and theatre including; “Rockets in Ursa Major”(1962), “Hamlet”(1963) and “Purple Dust” (1964). Leave a comment on ‘Oramics’ Daphne Oram. UK, 1959.